I have used nac for hangover prevention and I suggest it is 60-70 % effective in my experience. That the trial mentioned herein is flawed in that participants are administered the supplement after they have consumed all the alcohol. At the end of the evening. That the literature which accompanies NAC for hangover prevention states it should be taken an hour in advance of and then every hour or so, during an evening of drinking. Takne inthis manner, you are essentially absorbing nac, throughout the night, to help it build those antioxidants on the fly. That taking it after drinking is too late, as all the damage from acetylaldehyde has already been done. Hence the negative trial results. Well, that’s my anecdotal 2 bits. I have used it, and with decent success. It’s a common feature of alternative treatments, wonder supplements and other “biohacks”, that failures are blamed on the user. “Would you’ve taken it before, it would have worked!” – “Didn’t you know it can not be taken together with X?” and so on. 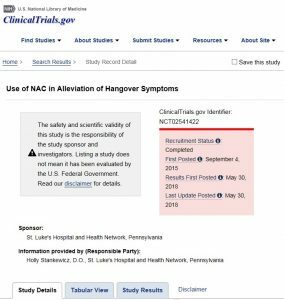 There is no credible “literature” to accompany any NAC product for hangover prevention. Simply because it’s not scientifically tested. The only thing we have in humans is this single study, and it’s negative. I could go on with a tractate about GI physiology to show you got the wrong idea how these substances “work”. But that would be nothing more than another rant w/o relevance for the question. If someone has a link to reliable information, please put it here for discussion. So far most does come from people with a commercial interest, not from scientific research. In my opinion the study you have linked is more ore less worthless because it has too less participiants and is using only a Median Value for the score. At least total Hangover symptom score is 10 vs 13 and nauseated score is 0 vs 1 for NAC vs Placebo. Though its insignificant the NAC users had a little less hangover than placebo users. Third, I am getting an alcohol flush reaction when drinking alcohol and for me it is greatly reduced by taking NAC. Most probaly NAC safes a little from Acetataldehyde intoxication. I am not really saing it will help against hangover for most of the people but it can have other positive effects and for people like me who gets an alcohol flush reaction the hangover is probaly reduced greatly. The study had enough power to detect meaningful differences. The side effects difference had trend-level significance (p=0,09 roughly calculated). If there had been a few more participants (1-2 more), it would have reached significance. For power calculation, see for example the good tutorial in Critical Care, which is already a classic and should be understood before claiming anything about “too small” studies. Other literature about biostatistics will tell the same (but is harder to read, in my opinion). This study is complete nonsense. Participants were given NAC at the end of the night, after drinking. Of course it’s not going to prevent a hangover if administered after a night of heavy drinking. I use NAC regularly, and it must be taken 30 minutes to an hour prior to drinking, with pills taken throughout the night with each drink. It works wonderfully if taken properly… I’d say about 70-80 percent reduction in hangover symptoms a night after heavy drinking. This study is ridiculous. I have zero commercial interest in NAC, but I do have an interest in my ability to wake up without a hangover in the morning, and my results, as indicated were reasonably worth while. Prior to taking NAC, I’d consistently wake up hungover after a night of drinking. As I got older, I could tolerate even less alcohol. Taking NAC had immediate effect for me. Anyway, I already admitted my results were around 70% effective, and agree they are purely anecdotal, but for you to suggest I am somehow doing it for “commercial interest”, or that I am somehow not credible, is plainly false. It worked for me. My experience is very credible. More credible than the trial I just read which was- by and large- a waste of time in the manner it was conducted, as well as your own “unfounded opinion”. I was interested to read the trial results, but the manner in which the trial was done rendered it usesess. Gastrointestinal physiologies notwithstanding. I didn’t mean you with that. To expect that such a comment would be in commercial interest, would be silly, as this blog is too unimportant…and I plainly hate discussions where others are un(dis)provably blamed for sinister agendas. Apologies if that was misunderstandable. Ha – my apologies in return. As soon as I submitted my response, I read your reply more fully and felt my reply might have been deemed a little defensive, so sorry about that. I still stand my my personal experience using NAC. Have honeslty been trying to find supporting literature for my experience which, as you indicated, does not exist, so was just a little disappointed at how they arrived at their conclusions. The trial meant little to me. I have also read literature that they adminster NAC for tylenol overdose, so it must have some antioxidant / liver benefit. I am sure there is also literature indicating its benefit in improving liver function, so really a harmless supplement to take if you are planning to drink alcohol. NAC definitely improves hangovers (not perfect but vast improvement) but it must be taken in advance. Again no commercial interest. Again: That was not aimed at commenters. If there is any reliable source for the claim that it works if taken *before*, please let me know. Otherwise it’s irrelevant for our question, because this post is about science and not personal views.